Disney magic. I say that phrase all the time, usually about some new ride or experience or character interaction that Disney comes up with that fills me with a sense of joy and wonder similar to my fondest childhood memories. But the "real" Disney magic, the stuff that makes me actually believe there is good in the world, lies within people. After the Walt Disney World 10k and the Cigna Blogger Event on Friday, January 6th, Matthew and I hit up the expo to pick up my packet for the marathon and browse all the fun vendors. Then we headed back to our hotel, Pop Century, to get packed up and ready to go for the half marathon the next day. 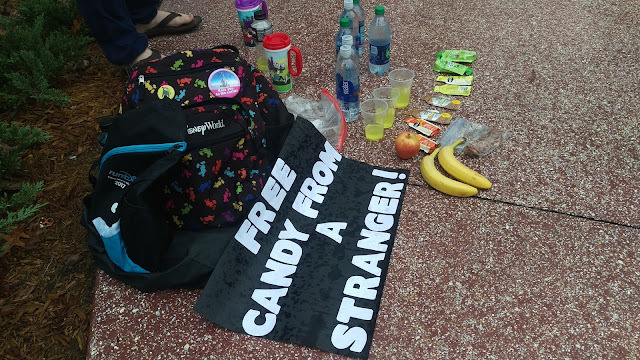 I had pre-packaged a ton of Swedish Fish, Sour Patch Kids, and Gummi Bears and planned to hand them out around mile seven of the half marathon. 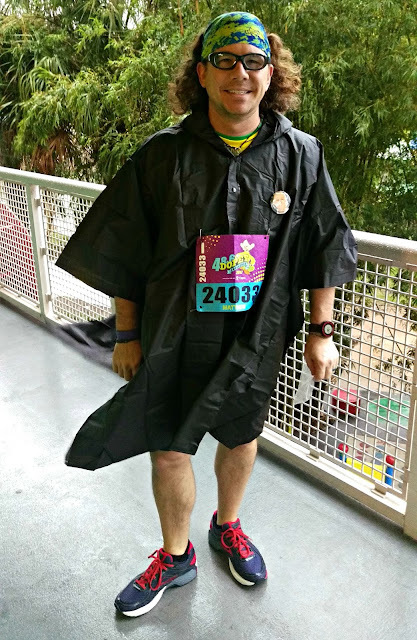 As Matthew was laying out his race gear and I was packing the backpack full of spectator goodies, we saw a notification on facebook; the 20th anniversary Walt Disney World Half Marathon and the Kid's Races were being cancelled due to lightening. Shock, disappointment, and eventual confusion set in- what would happen for Dopey/Goofy runners? Would there be any type of refund or deferral option? Would the weather actually be crappy on Saturday morning? 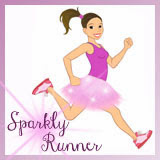 Turns out, runDisney did a fabulous job communicating all the important information that runners needed: Half/Goofy/Dopey runners would have deferral and/or refund options, Goofy/Dopey runners would get their medals after the full, and Half Marathoners/Kid's Racers would be able to pick up medals at the expo on Saturday. 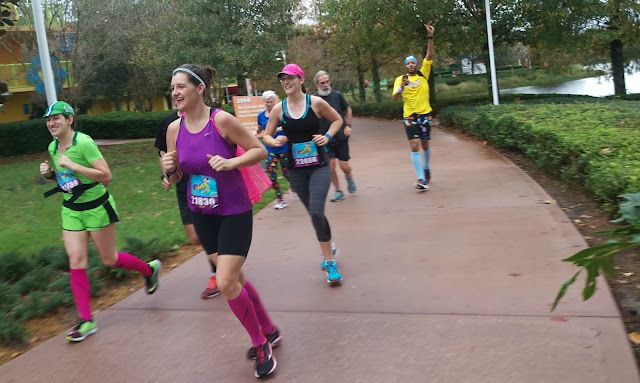 So while it was incredibly disappointing, the communication from runDisney was superb and we were grateful for them keeping 30,000+ runners and spectators in the loop. Once we knew the race was off, and we could sleep in a little, we walked over to Art of Animation and played "Exploding Kittens" with our friends Nathan, Jim, and Jim's mom for a while. Matthew already knew he wanted to run his own half the next day depending on the weather, so we didn't stay out too late. The next morning, Matthew woke up around six and checked the weather- it was pouring down rain and lightening like crazy. 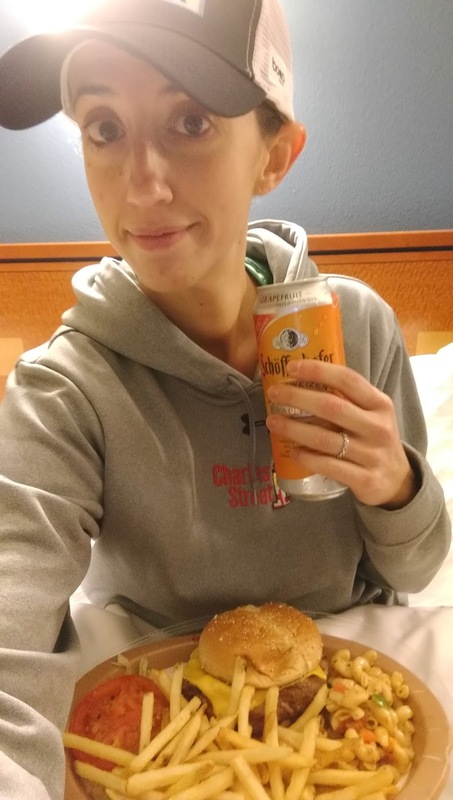 Looked like runDisney made the right call. At 7:30, it was just raining a little bit, so Matthew and I got up and headed our separate ways- he was going to run around the path between Pop Century and Art of Animation (about a mile and a half loop) and I was headed to grab coffee and then go down to the bridge that connected the two resorts to cheer and give out my candy. Glad I invested in these ponchos! I had my clapper, cow bell, race sign, pre-packaged candy, and a bag of pretzels. I could hear people cheering from the lobby/cafeteria area, so I hustled out to the bridge to see how many people were out running. Nathan had texted and he was going to meet me. I don't think Matthew and I were prepared for what we saw: so many people were out running and cheering- it was awesome! 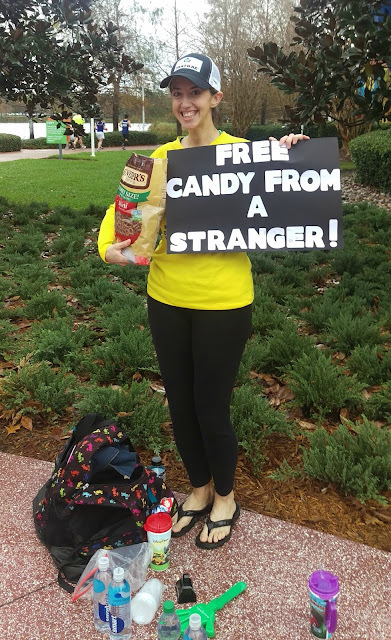 Then, a man came up to me and gave me some bananas. Then someone brought over extra gels. Then a dude gave me a bottle of water and said, "I'll donate to the cause." 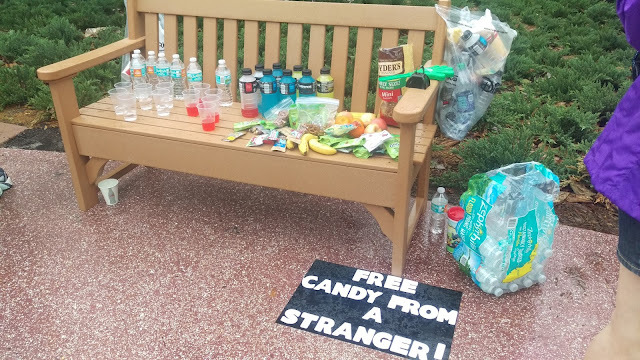 Then two other spectators brought over a bench and we had a serious aid station. Jim and Charlotte (Jim's mom) joined us and started filling cups of water and powerade and passing them out to runners. Nathan worked on getting us paper cups donated from the cafeteria and I was standing on the corner yelling to runners, "Water, powerade, snacks, on your right!" Panoramic view of the official aid station of the unofficial Pop Art Half Marathon. 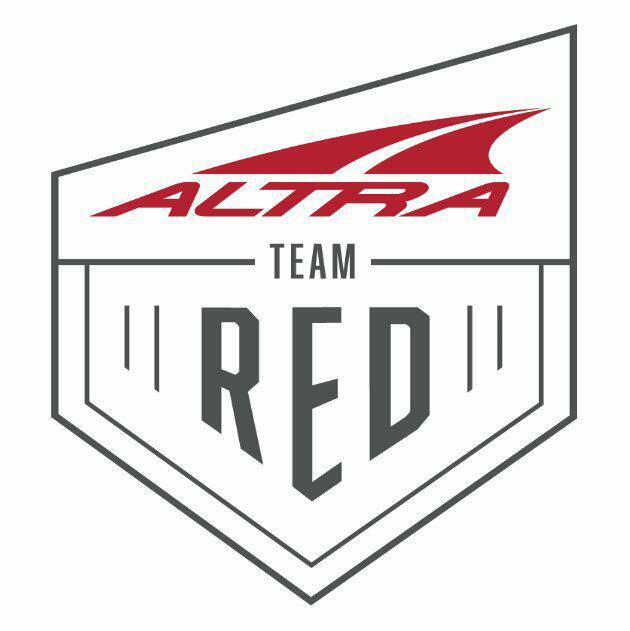 We became quite the team and were having a total blast! We were working efficiently and quickly, making sure runners were fed and their thirst was quenched. Because most folks were running loops, we were able to cheer for multiple people more than once- we even created fun nicknames for some of the runners: "epic beard man," "tall guys," "green shoes," "sparkle ladies," etc. Seriously, it was so much fun. I got to see several friends (including Linzie from Sharp Endurance) and got to see Matthew quite a few times. 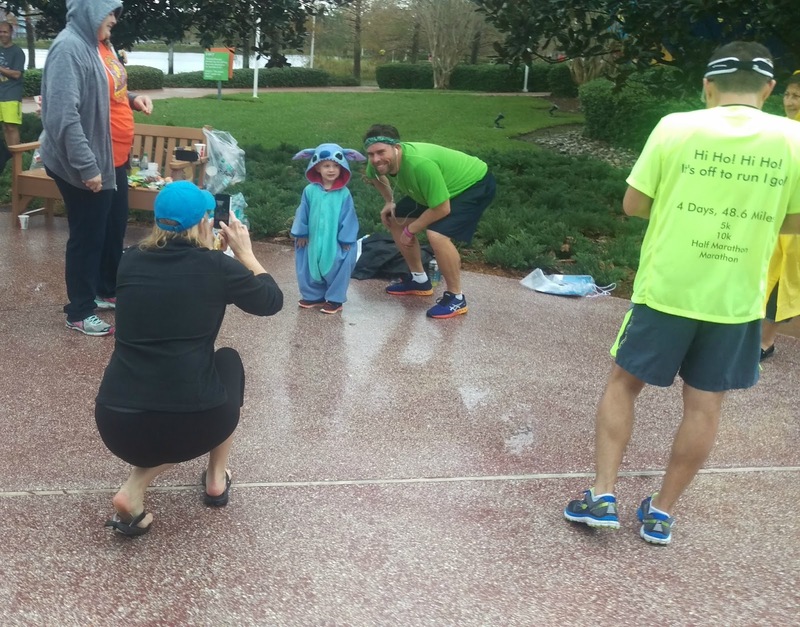 Jim's wife, Kellee, and their two-year-old son, Trent, came out to help us and Trent brought his Stitch costume. Suddenly, we had a character stop! At one point, there were probably 10 runners in line to get a picture with "baby Stitch." A young man who had been cheering near us came up to me and handed me a "I'm Celebrating!" Disney pin with "candy from a stranger" written on it. I choked back tears and hugged him. It was such a cool moment. He explained that his mom had uploaded some videos of us to the Team runDisney facebook group and they'd gotten thousands of likes. Humbling to say the least. Baby Stitch is my new hero. Nathan went back and forth to the dining halls at both resorts several times to get more cups donated and to buy more powerade and water- he must have spent hundreds of dollars to keep our runners from getting too thirsty! 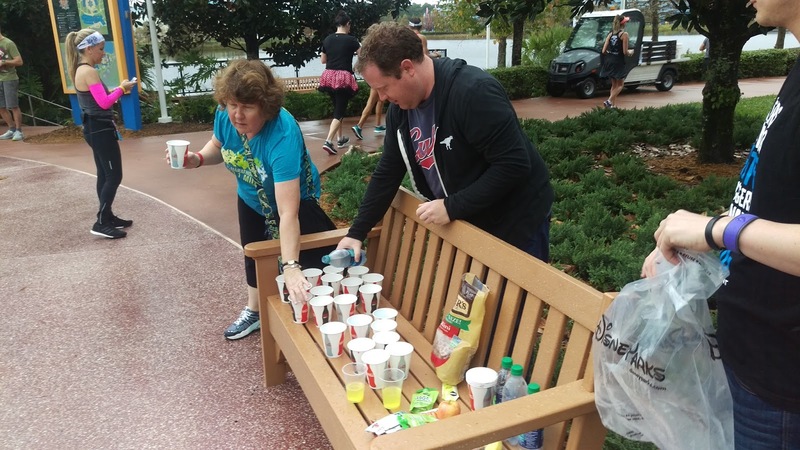 Folks kept donating food to us- lifesavers, apples, applesauce, chips, even left-overs from runDisney runner boxes! A guy in a Team runDisney shirt approached me with a case of water and said he saw us on facebook and drove over to give us more water. 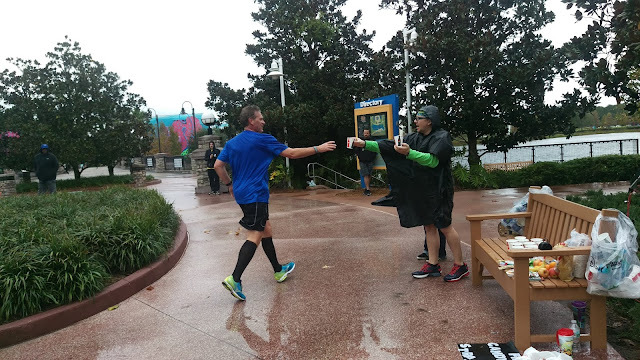 He ended up being Matt Marcella, the founder of Team runDisney (!!!). 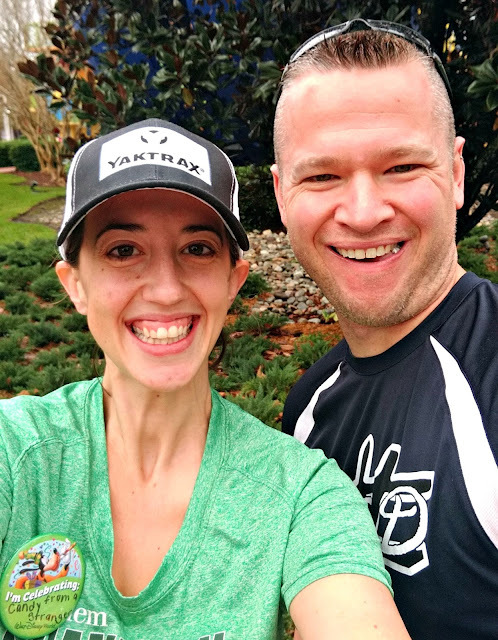 So, we chatted, got a selfie (obviously), and then he hung out cheering for the runners and getting some live video of the unofficial half marathon. I meet the coolest people on the internet. Matthew finished his half (because he's a damn rock star!) and then came out to help us at the aid station. I made him a medal by fashioning a luggage tag (it was in the shape of the actual medal) to a piece of string from a runDisney gear check bag. Jim grabbed his portable speaker and then we had music to keep our energy levels up. It was glorious; especially because it starting raining and getting super windy. All of our donated snacks! I don't think I'll be able accurately describe the magic of that day and that event. 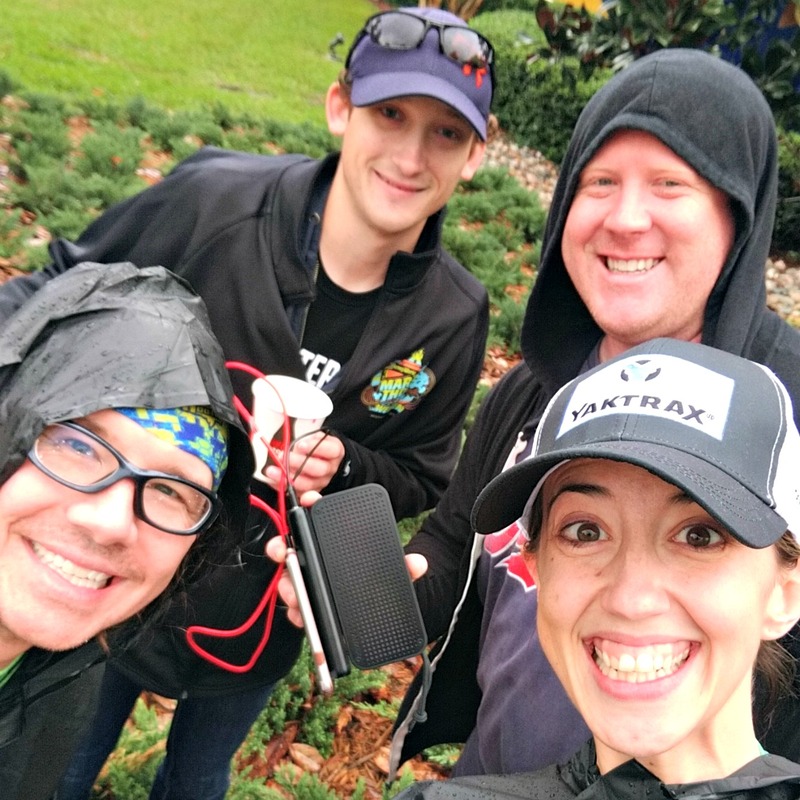 It filled my heart with so much love to see all the runners, determined to get their miles in; the spectators, cheering their hearts out in the rain; and all the people who donated and helped staff our aid station. Pure Disney magic. 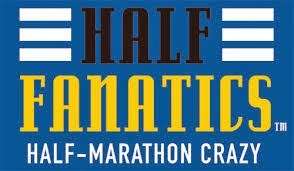 So even though this was the "half that wasn't," it will go down in history as my favorite race of all time. 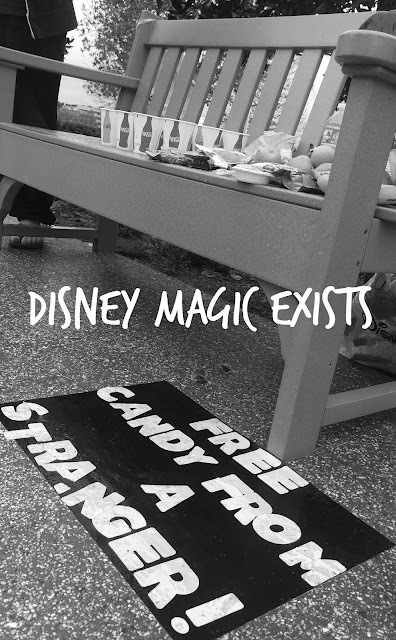 All because Disney magic exists- in the hearts of each of us. 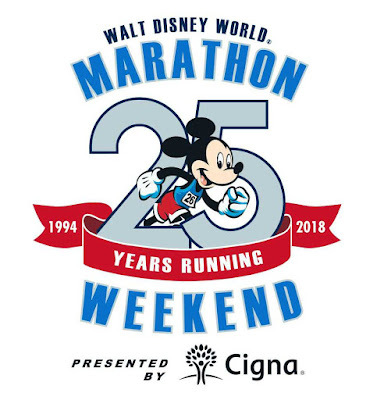 As someone who ran both 2014's Splash and Dash and 2015's Wine and Dine 7-miler I understand the disappointment all the runners must have felt when the WDW Half was canceled. 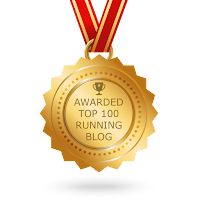 I especially feel for all of those runners who trained so hard for the half or the challenges only to have that taken away. When I saw all the Disney Magic that unfolded that Saturday morning on social media, I was blown away! It just made my heart happy to see all of those runners running anyway (I might have opted for sleep). Even more magical, all of those spectators cheering them on! Your water, Powerade, food, and character stop was nothing short of awesome! Thank you for not only sharing that magic and positivity with the runners that morning, but with all of us watching it unfold online! You made a lot of people smile when some of us really needed it. It made me so happy, and so proud, so see all of the posts on social media that day. Who knew that you heading out to do what you had planned to do during the race would evolve into what it did. What an incredible experience, Sarah, and kudos to you for getting the party started! Thanks, Kathryn! It was a special day for sure! Hahaha that's me in the purple tank in your pic! I was doing dopey with my sister and a friend. What happened that day was amazing and THANK YOU to everyone who came out and cheered and supported the runners. What was a huge bummer ended up being one of the most memorable races ever.